 Vagnsset med 4 personvagnar typ DB "Heckeneilzug"
Vagnsset med 4 personvagnar typ DB "Heckeneilzug"
Denna produkt ger dig 1394 bonuspoäng. Vagnsset med 4 personvagnar typ DB 'Heckeneilzug', totallängd över buffertar 420 mm, epok IV. Once there was a quite different, contemplative travel experience without constant worries about failed connections, with working restrooms, and with windows that could be opened. We're talking about the 'Heckeneilzügen' / 'Backwoods Limited Stop Passenger Trains' that enabled connections free of transfers for many years via branch lines between regions not on the main lines and the large metropolitan areas. On the branch lines, they stood out with comparatively comfortable cars as exotic bright spots among the usual rail busses and rebuild cars. These trains formed the backbone of passenger service in the country in the northern part of Germany into the Eighties and occasionally they even warranted through cars. 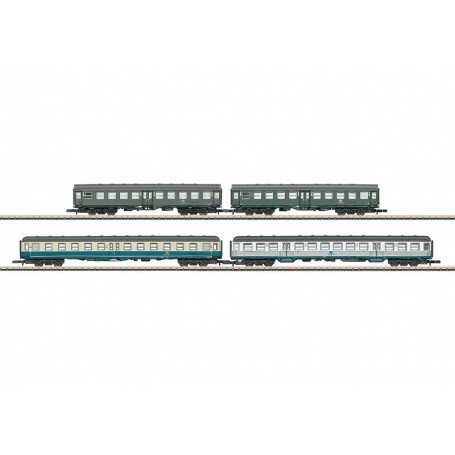 Prototype: So-called DB 'Heckeneilzug' / 'Backwoods Limited Stop Passenger Train as it looked in Era IV, consisting of a type Byg 514 rebuild car, 2nd class, in chrome oxide green, a type Bnb 719 commuter car, 2nd class, silver / ocean blue, and a type Bym 421 center entry car, 2nd class, in ocean blue / ivory. Realistic paint schemes and lettering. Model: All of the cars have realistic paint schemes and lettering. The cars have close coupler hooks and each car has different interior details. Total length over the buffers approximately 420 mm / 16-1/2'. The 87549 set is being produced in a one-time series only for the Märklin Dealer Initiative (MHI). This set goes with the 88202 locomotive.